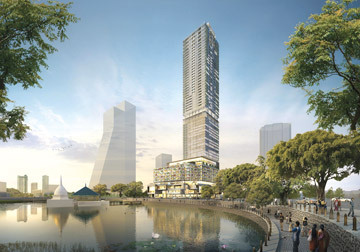 Abans Lifestyle Mall, which will be named Colombo City Centre, will be unique as it will be the first and only Lifestyle mall in Sri Lanka on par with the huge super malls in Singapore and Dubai. It will offer Sri Lankans as well as tourists to our country a place where they can come and spend the whole day with their families and enjoy the many faceted attractions all under one roof. The first five levels of the Centre will consist of a 230,000 square feet lifestyle retail mall. Above the mall there will be a 200-room NEXT Hotel, the flagship brand of SilverNeedle Hospitality, and the first such hotel to be launched in Asia, after Australia. Estimated cost US $150 million.